The TI-36 SOLAR added a useful display with 10 digits for the mantissa and 2 digits for the exponent plus solar cells to the TI-35 line. This calculator was manufactured by Inventec Corporation in Taiwan, a contract manufacturer even 20 years later still in charge for Texas Instruments. In 1987 the TI-36 SOLAR got smaller solar cells and some minor design changes. View the updated calculator here. A similar, more colorful calculator was introduced in 1987 with the successful TI-34. 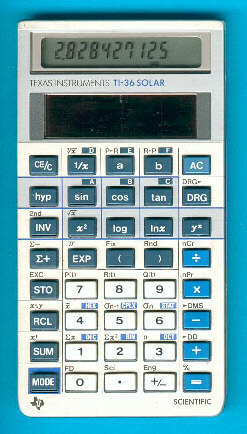 The TI-36 SOLAR is featured in the Texas Instruments Incorporated bulletin CL-883 dated 1986.